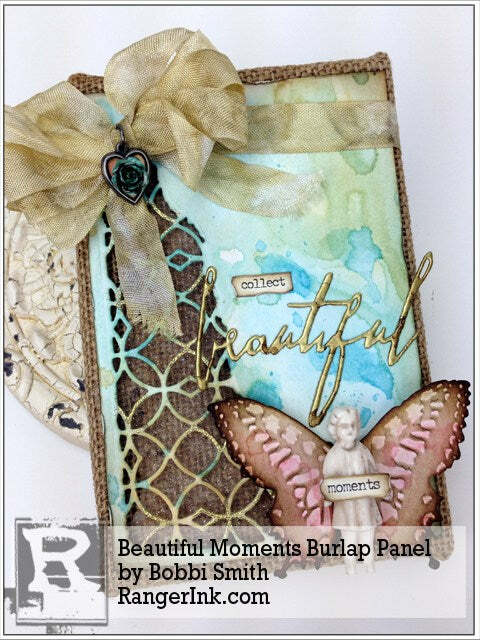 Guest Artist Bobbi Smith shares how to create a mixed media burlap panel decor piece. 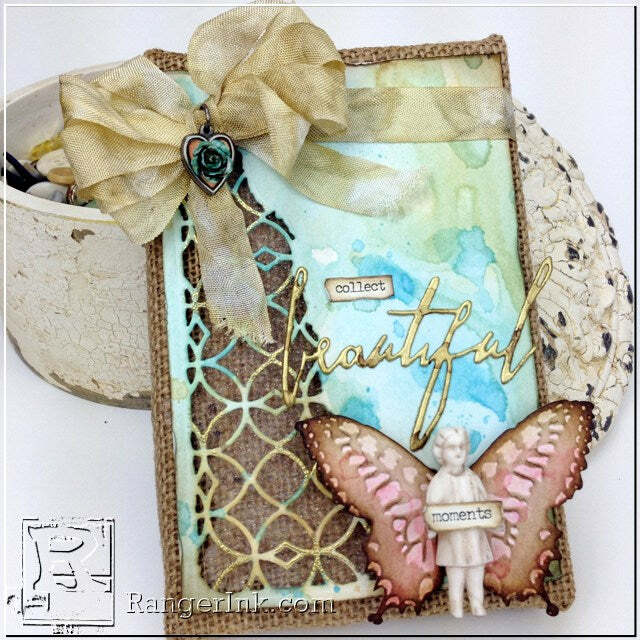 Guest Artist Bobbi Smith shares how to create a mixed media burlap panel decor piece. You can easily adapt the look and techniques of the piece to your cards and art tags too! 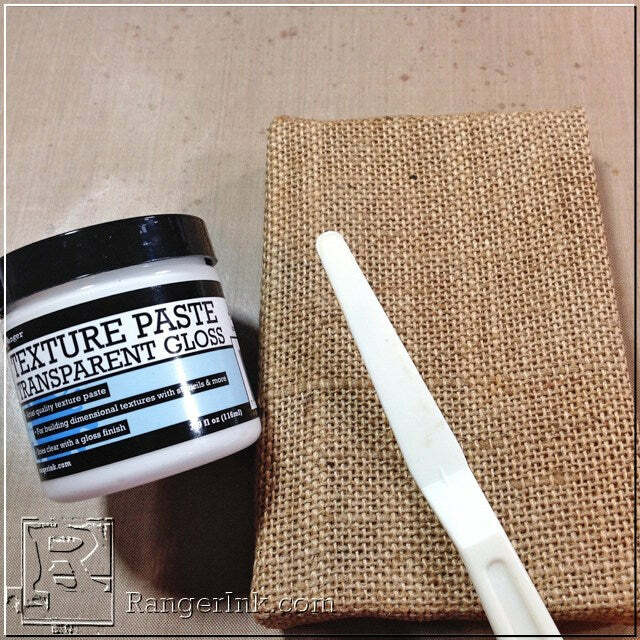 Apply a thin layer of transparent gloss texture paste to the left hand side (top to bottom) of the burlap canvas using a pallet knife. Apply a generous amount of Clear Rock Candy Distress Stickles Dry Glitter to wet paste. 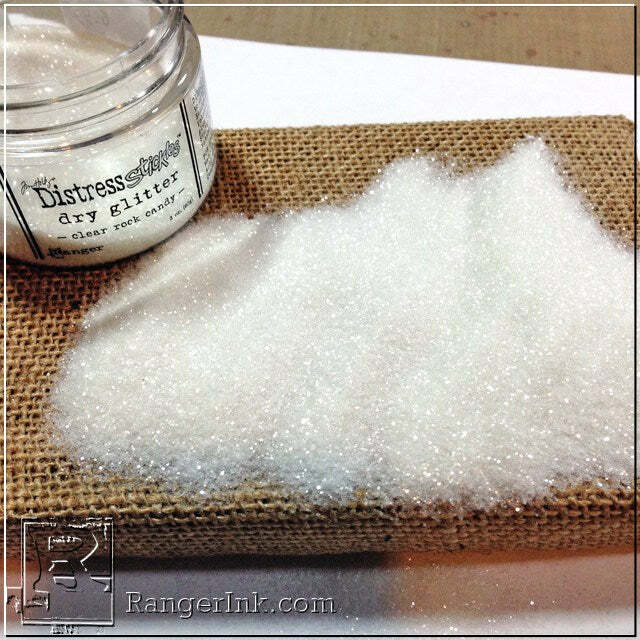 Shake off excess glitter from burlap canvas and set aside to air dry. It’s hard to see in photo, but the combination of the transparent gloss texture paste and the clear rock candy glitter creates a brilliant sparkle when dry. Yet you can still see the great texture of the burlap canvas. 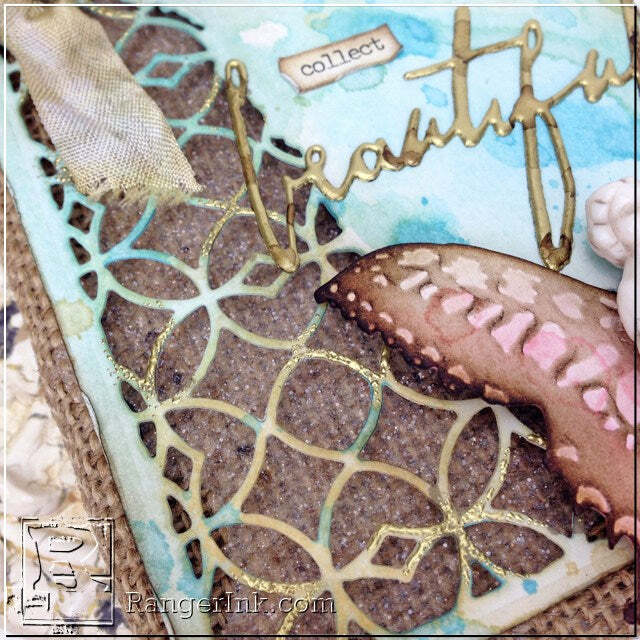 Die cut a piece of Ranger watercolor paper using the Tim Holtz Latticework Mixed Media die. Lightly mist watercolor paper with water. Then mist puddles of Tim Holtz Antique Linen and Tumbled Glass Distress Spray Stain onto the watercolor paper. Then mist again lightly with water to get the colors to move and blend (the more water you add, the less intense the color will be). Dry tag with heat tool. Now you have all the lovely color still left on your nonstick craft sheet. I like to add more distressed to my project. Pick up droplets of color off the nonstick craft sheet with watercolor cardstock blotting to picking up the color (not swiping) then drying with heat tool. Apply Walnut Stain Distress Ink using blending tool to create shading around the outer portions. Use bone folder on outer edges to create distressing. Die cut another piece of Ranger watercolor paper using the Tim Holtz Butterfly Duo die. I only ended up using the 2nd butterfly on the Burlap Canvas, you can save the other one for another great project. Lightly mist butterflies with water. 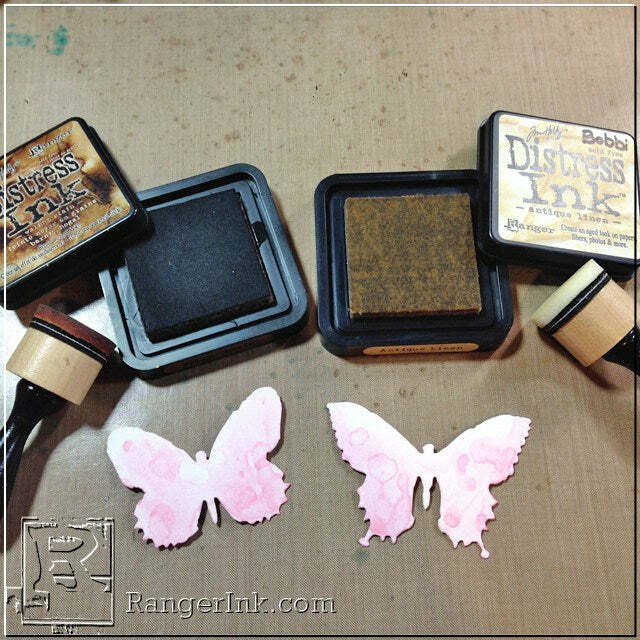 Then mist a puddle of Tim Holtz Spun Sugar Distress Spray Stain onto the butterflies. Then mist again lightly with water to get the colors to move and blend (the more water you add, the less intense the color will be). Dry tag with heat tool. Again, you have all the wonderful color still left on your nonstick craft sheet. I like to add more distressed to my butterflies. 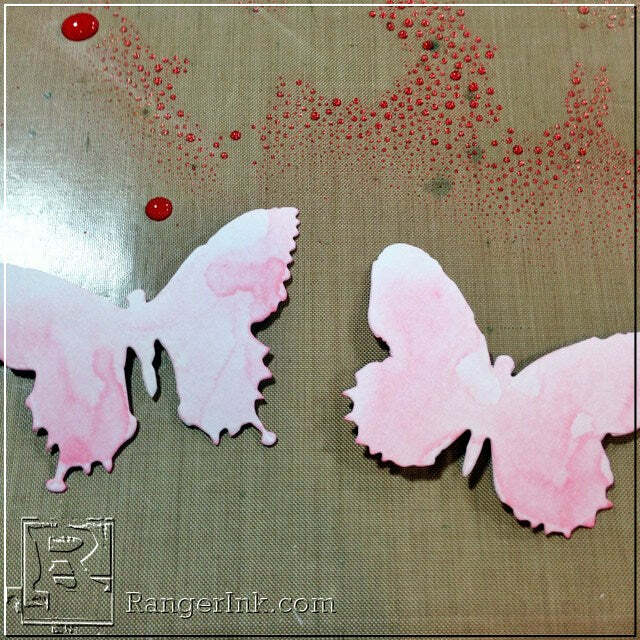 Pick up droplets of color off the nonstick craft sheet with watercolor card stock butterflies blotting to picking up the color (not swiping) then drying with heat tool. Add shading to the butterflies using Antique Linen Distress Ink and a blending tool. 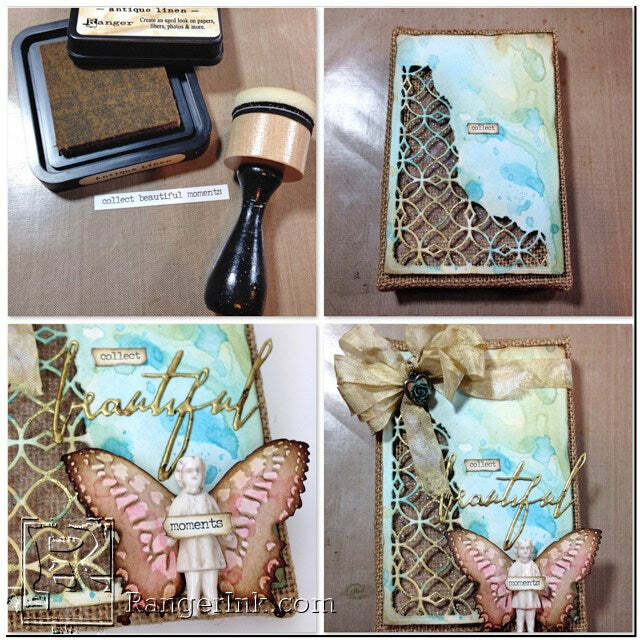 Using the embossing folder that is accompanied with the Butterfly Duo die, run the butterflies back through the Vagabond to create the embossing with the folder. Apply Walnut Stain Distress Ink with the blending tool to the raised portion of the butterfly. The results are a beautiful striking contrast with light and dark colors. 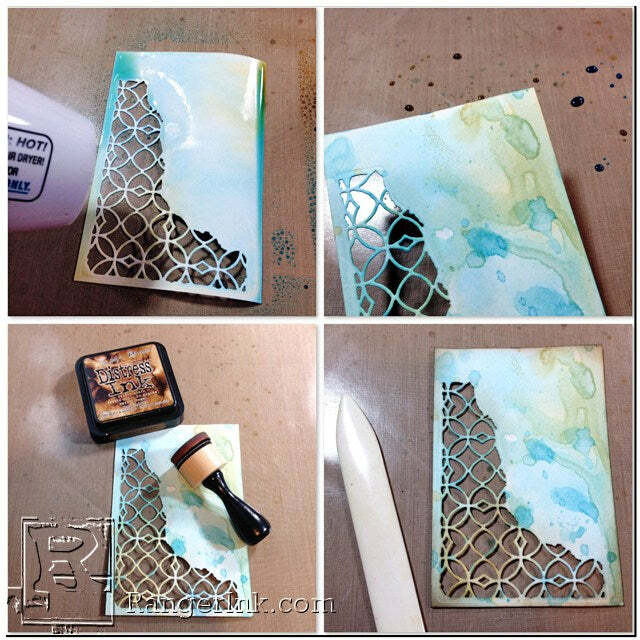 Using the Embossing Dabber, lightly swipe a small portion of the latticework cut out with dabber (you only want to highlight a few areas here and there). Sprinkle Ranger Gold Embossing Powder over ink and shake off excess. Melt embossing powder with heat tool. Die cut a piece of manilla cardstock using the word “beautiful” from the Handwritten Love Thinlits die set. 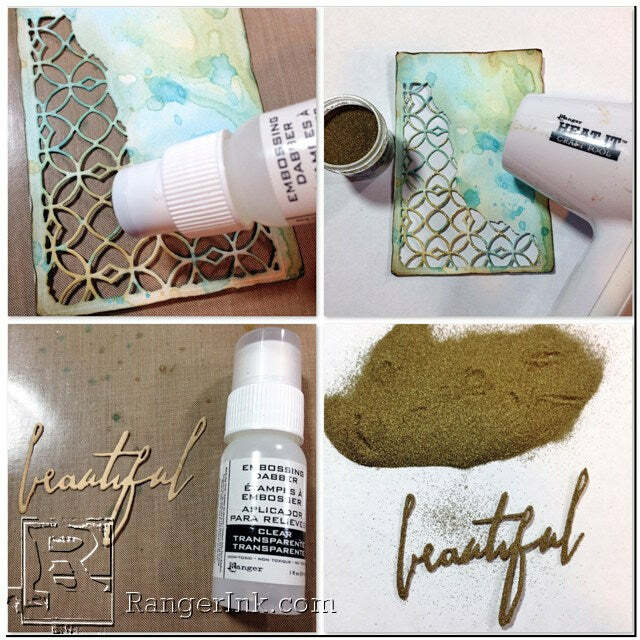 Using the Ranger Embossing Dabber, cover the entire surface “beautiful”. Sprinkle Ranger Gold Embossing Powder over ink and shake off excess. Melt embossing powder with heat tool. 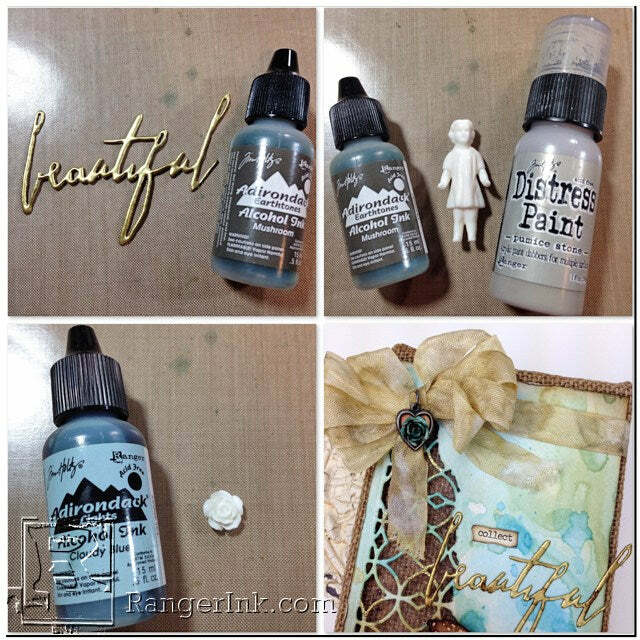 Apply Mushroom Alcohol Ink with alcohol ink tool to the embossed word “beautiful”. Apply a little Pumice Stone Distress Paint to the Salvaged Doll, then wipe off any excesses (you really only want the color in the nooks, crannies and crevices). Apply Cloudy Blue and Mushroom Alcohol Ink to the Heirloom Rose using an alcohol ink tool. After dried, adhere the rose to a heart charm using glossy accents. Apply Antique Linen to the Small Chat to lessen the intense white background. Cut apart the three words to use them individually. Shade the words “collect” and “moments” with walnut stain distress ink. Using a bone folder, distress the edges of the words “collect” and “moments” as well. I dyed a little crinkle ribbon with Antique Linen Distress Spray Stain, to create the bow. Attached the Latticework with Ranger Adhesive Foam to the Burlap Canvas. Glue the words, butterfly, salvage doll with glossy accents. Tie off bow and attach the heart charm with an O-ring to the center of bow. My name is Bobbi Smith. I’ve been a crafter all my life, however I really found my niche in paper-crafting about 20 years ago, when my children were young and have never looked back. I love all forms of Art, but really gravitate towards vintage, distress and grunge styles. I live in Illinois and love to hunt for vintage finds, when I’m not paper crafting! Check out my blog at Vintage Muse Designs.